The last thing we want to see on any of our machinery or equipment is rust. So how can we prevent it? To start, it helps to understand why rusting happens. Rust occurs when iron suffers from open-air oxidation, but what does this mean? It means that rust is the result of the iron materials that make up your machinery and equipment reacting with water and oxygen to create iron oxide. 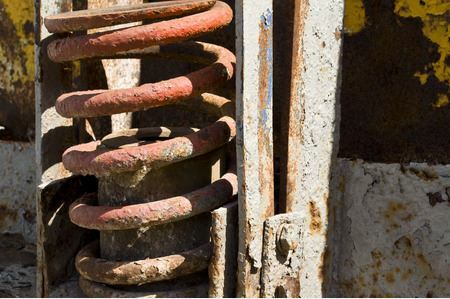 This can occur below paint, even, causing the surface to puff out and bubble up before beginning to flake off, exposing red, rusty metal that can expand and leave your equipment weakened and corroded. These types of items are sold all over and are commonly found in aerosol cans or come as gels and liquids that you can apply to your tools and machinery. Follow the instructions on them to give your stuff the best chance at not rusting. A rust coating is perfect to prevent rust from happening, but can often be used on items that show a few signs of starting to fall victim to rust. Applying this protective layer will help control rust and corrosion or prevent early rust problems from expanding and worsening. Just as you do with your car, washing and waxing your equipment regularly can help protect it – and make it look great! Cleaning can remove dirt and debris from the surface that can attract moisture, says How to Prevent, while waxing adds a thin protective layer of was over the body of your machinery, keeping it isolated from exposure. If you have a private enclosure where you store your machinery between jobs, consider using a dehumidifier in the area. These units pull moisture out of the air, which can help prevent exposure to water in the air while your equipment isn’t in use. Whether you’re in the market for new machinery or looking to replace your existing old and rusted equipment, let Rackers Equipment Company help. Shop our full selection of new and used mining and aggregate equipment online now, or call us at 573-635-8700 today to learn more!